Having a simple conversation in Swedish would be “inget problem” for you! 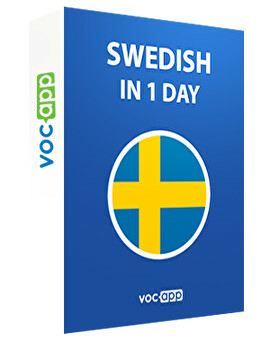 Learn Swedish online - fast and easy - with VocApp! Interested in learning the Swedish language? Fascinated with the Scandinavian languages? With VocApp’s language course you can learn Swedish in an effective and entertaining way using flashcards and different study modes including pictures, example sentences, and recordings on how to pronounce different words. VocApp’s learning methods combine several senses – visual learning with pictures, audiovisual learning with the pronunciation recordings, and so on - which will improve the learning process significantly. Our language learning app offers you a great opportunity to get started with your Swedish language studies. With our "Swedish in one day" course, you learn Swedish language basics in an easy and entertaining way. Our multiple-sensory learning methods are the best way to learn Swedish. Is Swedish hard to learn? Not with VocApp! Our application is user friendly and offers variety of study methods. To make your studies easier and more effective, each word will be combined with an example sentence to show you how to use the word. The course is from English to Swedish, but VocApp also offers courses from Swedish to English – so, something for everyone! Study this lesson to learn some Swedish basics, useful Swedish words and phrases. Learn how to speak Swedish with our mobile app wherever you are – at home, commuting… If you have been wondering, how to learn Swedish, you have found your solution now! Are you looking for actually effective language learning apps? No need to search anymore! VocApp’s multisensory learning and flashcards are proven to have positive results. Regularity is important when learning a new language so you can set VocApp to send you a reminder every day at your chosen time – this way you won’t forget to study! Even only 5 minutes per day will help you learn how to speak Swedish. Learning Swedish has never been so easy and fun!